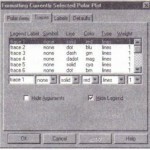 • By saving as defaults the settings of your current plot. • By using the Setting Default Formats for Polar Plots dialog box to set defaults, if.” you don’t want to use an existing plot. 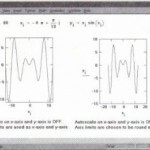 • Changing defaults only affects new polar plots; previously existing plots are unaffected. 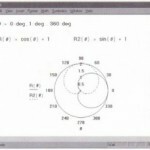 One way to create a new set of defaults is to use the format settings of an existing polar plot. The advantage of this method is that you can use “Apply” to see how the format settings look while you define them. • Select the graph by clicking on it. 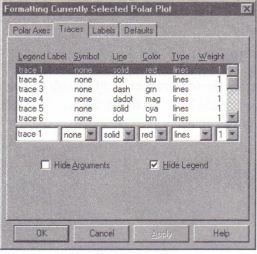 • Click the Defaults tab on the dialog box for formatting polar plots. The Defaults page appears, as shown below. • If the Use for Defaults check box isn’t checked, click on it to add one. When you close the dialog box, Mathcad saves these settings as your default settings. • Make sure that you don’t have any plots selected. 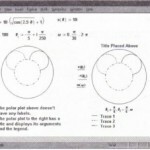 • Polar Axes page displayed . 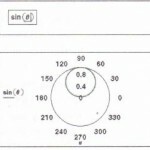 • Change the appropriate settings on the Polar Axes and Traces pages. 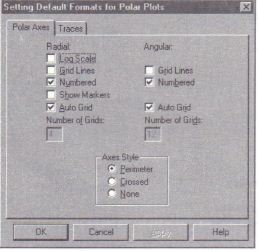 • Click the Defaults tab on the dialog box for polar plots. • Click “Change to Defaults”. 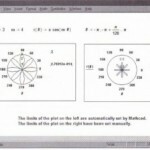 Mathcad redraws the plot, using the most recent set of default format settings. Mathcad does not use any defaults you might have set using the Use for Defaults check box at any time after the creation of this plot.